Science of Logic - Tolle Lege!. Which way does the sun rise in the morning? Most people will say in the east, dummy. They are of course wrong. The sun doesn't rise in the morning but we think of the earth as rotating around a relatively fixed sun (even though the sun is moving too, that's why I say 'relatively fixed sun'). I enjoyed this book immensely and know it can be hard going because the way the author writes. Instead of reading this book, one could watch the second season of Mr. Robot and walk away with some of the major themes contained in this book ('Mr Robot' is definitely very Hegelian). The alienation of the individual within the society because of the qualitative and quantitative dichotomy present in the world or as Hegel would say, 'it is the other in its own self, the other of an other; therefore it includes its own other within it and is consequently as contradiction" (you just have to love someone who writes like that). Also, in particular the second season completely plays with Appearance and Reality to the point of view where the viewer gets mislead. Come on, even one of the episodes this season was labeled "master slave'. There is a difference between 'appearance' and 'reality' between the objective and the subjective. Hegel will say in his 'objective' part of the Logic that 'being is the indeterminate immediate'. I'll unpack that statement from Hegelian speak to English. But, first I must make a couple of digressions. I ended up reading [b:Parmenides|381185|Parmenides (Philosophical Library)|Plato|https://images.gr-assets.com/books/1390394394s/381185.jpg|370973] as I was reading the Logic. It's by far the best of Plato's dialogs that I've read so far and it's the most important. It's only an hour and a half long and I would strongly recommend it. It's unique for Plato. It's the only dialog where Socrates comes out not winning (with the possible exception of the Symposium, but that is about love, and that's not really my cup of tea anyways). The Logic is a response to the 'One' within Parmenides. Hegel must create the 'Notion' (the dialectic of the Idea) in order to bring back the absolute knowledge because if Parmenides is right (and I definitely am on his side) then we are forced into relative truth that must be contingent, particular and uncertain when we apply the knowledge to reality. The second digression is that one should not only read Parmenides but also Spinoza's Ethics. Otherwise a lot of the arguments won't make sense to the reader and Kant's Critique of Pure Reason needs to be read also. Now I can start to unpack 'being is the indeterminate immediate'. Spinoza will say that 'every determinate is a negation'. For Spinoza we all live within 'the mind of god' (my words) and there is only one substance but two attributes (but probably infinitely more) and those attributes, mind and body, are infinite because they are god and every limitation is a determinate and they are therefore finite and are a negation of the infinite. The immediate is the thing itself with out the filter of the mind. BTW, Hegel really loves Leibniz (and who among us doesn't except for Voltaire and Newton) and I would recommend reading the Monadology (easily found for free of the net) before reading the Logic. I guess it's really not hard to realize why I love Hegel so much. He puts many different thoughts together and talks in such a dense language and I'm just surprised that everyone doesn't love him as much as I do. Of his two books, Phenomenology of Spirit (Mind) is the funner book to read. He didn't always take himself so seriously as he does in this book. I like the way Hegel writes. He deals with the changeless, the necessary (or as Heidegger refers to it the 'atemporal'). Plato refers to the study of mathematics as the study of the changeless. Ultimately, math is the study of abstract entities which get their meaning from their relationship with other abstract entities by appealing to the relationships of 1) identity, 2) consistency and 3) coherence [and also set theory, but I don't won't to bring up Godol because that would be an anachronism]. This book is written as if the universe is universal, necessary and certain. After all, Newton and his physics are given to be absolute at the time of the book. 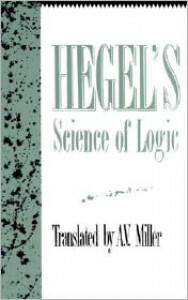 (another aside: Wittgenstein in his Tractatus is obviously influenced by this book, but only acknowledges Frege not Hegel. BTW, Sartre in his Being and Nothingness does a fine job when he talks about Hegel. Though, I don't recommend B&N because Sartre is not really a philosopher. You be the judge). Most of Hegel's chapters and subdivisions are divided into threes for a reason He's always relating his 'Notion' by those three laws of logic. He cleverly restates them as 1) the thing must always equal itself, 2) likes never exist (or no two things are exactly alike), and 3) opposites never can be. He'll take this concept apply it to the 'syllogism' and make each part of the syllogism the 1) individual, 2) particular and 3) the universal. He constantly brings his thought back to the rules of logic. Ayn Rand really hated Hegel. I don't think she ever read him and I know she never understood what he was saying. Her comic book religion (oops, I mean philosophy), Objectiveism, is an obvious kindergartners response to Hegel. Hegel is obviously responding to Hume but he never mentions him. Hume says: You never see the gravity; You never see the cause; You can only see the effect. Hegel comes up with his Notion with his dialectic to end all skepticism because he would say we construct the reality that is real and it accords with reality and Gravity must be real and Newton is absolutely right because f=ma can not not possibly be true. (Einstein will disagree because he will put in the relativistic constant, i.e. if you are going at or near the speed of light it makes a difference).